When I was in Oaxaca, I watched the film, The Lives of Others of others with a fellow hosteler. It’s set in Soviet East Berlin in 1984 and it revolves around the life of a writer who is being spied on by the Stasi (East German secret police) and the transformation of the agent who is spying on him. It was immediately clear that the film’s cinematographer was aiming to recreate the dark atmosphere of the time. What I also noticed was that unlike other well known European cities that I’ve seen countless images of, I had very few images of Berlin in my mind prior to watching the film. The most prominent scenes that came to mind were outdated ones of 1989 on the night the wall fell. A couple days into my time in Berlin, the weather eased up and I decided to take a recommended walk along Karl-Marx-Allee. It seemed that if there was iconic scenery in the city beyond places like the Brandenburg Gate and the Space Needle-esque TV tower, this could be it. 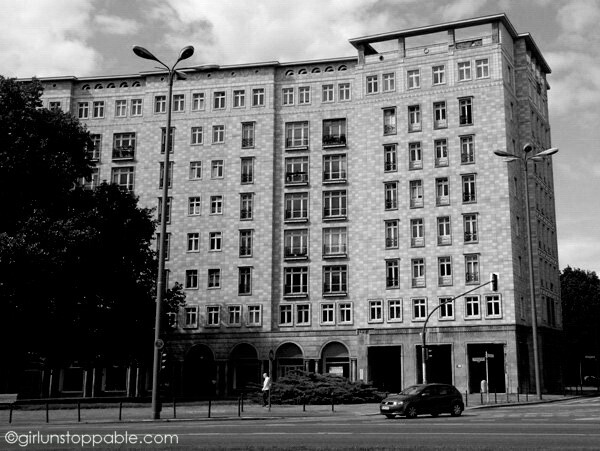 It’s located in the neighborhoods of Friedrichshain and Mitte and it was built as “Stalinallee” after World War II to be a grand socialist boulevard; a wide street lined with luxurious apartments, shops, and restaurants. 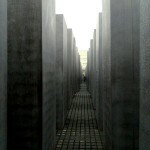 So I took a stroll along the allee, and unfortunately, I failed to see the grandeur in it. 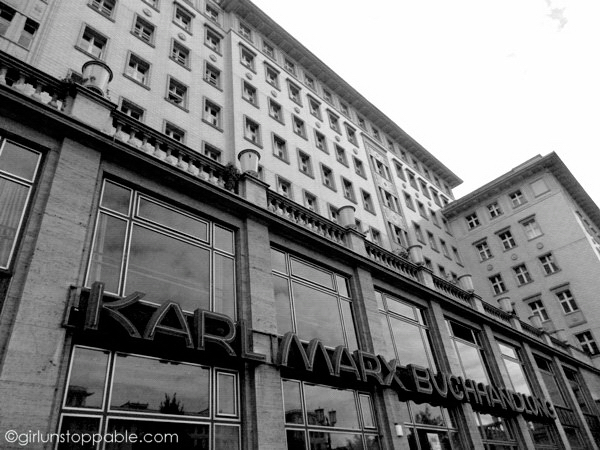 Its buildings were way too pragmatic and humorless for my tastes. The streets were uneasily empty. The starkness combined with the oversized boxiness created an aura as somber and smothering as in The Lives of Others, even though it was the first time I was seeing the sun in Berlin. 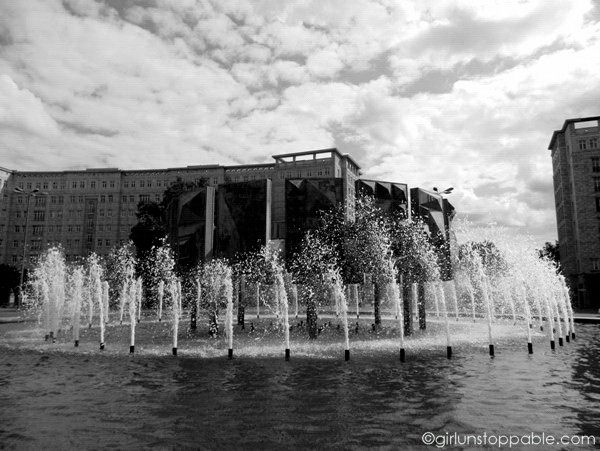 But this is how I found Berlin to be — sometimes gloomy regardless of the weather and always fascinating. 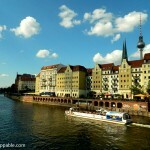 Like Mexico City, Berlin was built on unstable swampy ground. 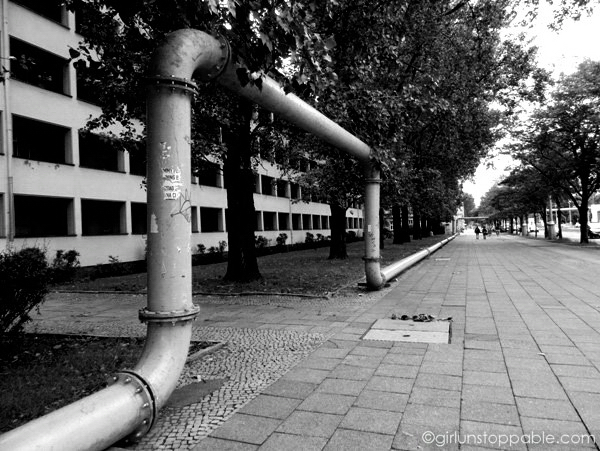 Because of this, you’ll sometimes see pipes running above ground that look like a wacky public art exhibit. This was once a bookstore. If you have seen The Lives of Others, you may recognize this from the closing scene. This street has had a few name changes in it’s lifetime. Originally, it was called Grosse Frankfurter Strasse. 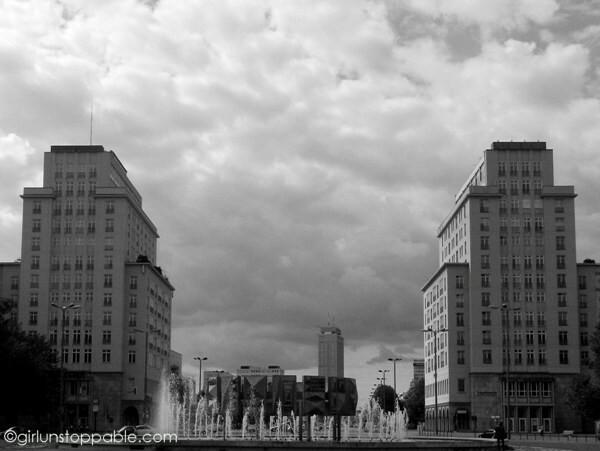 When the new design rose from the rubble of World War II, it was renamed Stalinallee from 1949-1961. 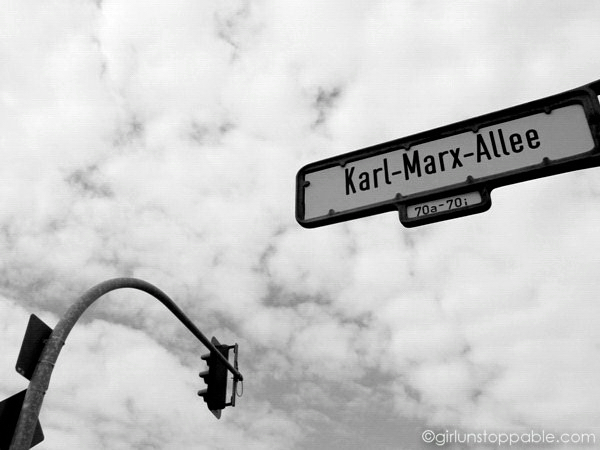 After Stalinism fell out of favor with the Soviets, it was renamed Karl-Marx-Allee. 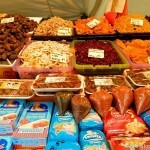 Today, some feel that it should return to its original name. They were trying to achieve a “wedding cake” architectural style on the boulevard, so many of the buildings are tiered like this. 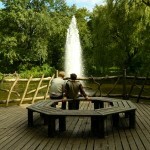 The Schwebender Ring (Floating Ring) Fountain. The residences on this boulevard were supposed to be luxury apartments for the people, but except for a few lucky members of the working class, they were mostly for the well-to-do. In June of 1953, the construction workers who were building this street went on strike against increased work quotas without compensation. 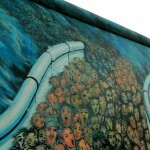 Their strike sparked an anti-government working class uprising throughout Berlin and other major cities of East Germany. The government used violence to end it and an unknown number of protesters died in clashes with the military on this street. 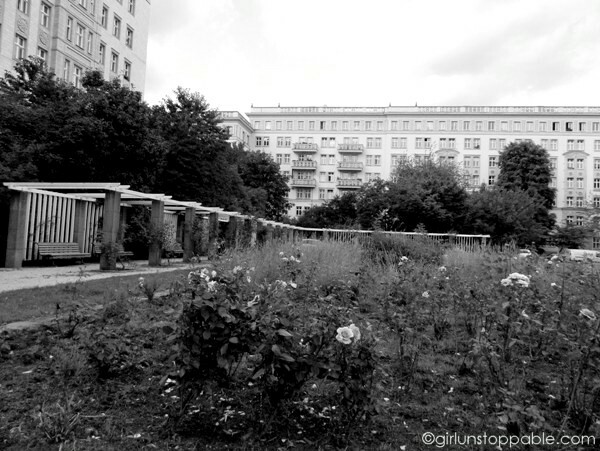 A small garden brought some life to the eastern end of the boulevard. 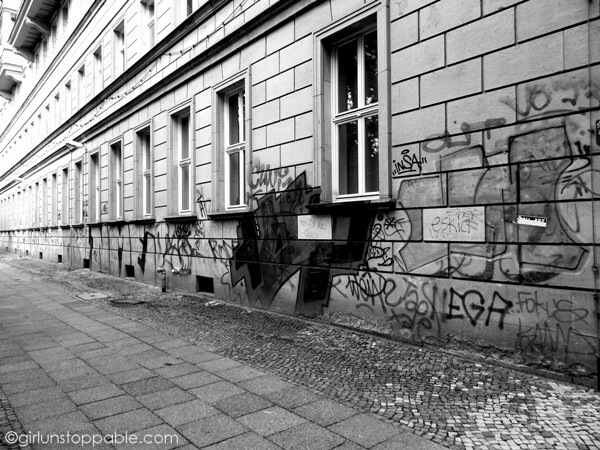 This will always be one of the new lingering images I have of Berlin — 90 degree angles and order embellished with graffiti. Difficult to feel the love and yes BW photos capture that feeling or lack of. I knew this post would be unpopular! It’s kind of bleak- not the kind of stuff people want to see on a travel blog. I was definitely trying to present this in a way that honestly captured my experience there and for the most part, I feel like it does. I just wished I’d gotten some more photos of the really massive buildings.